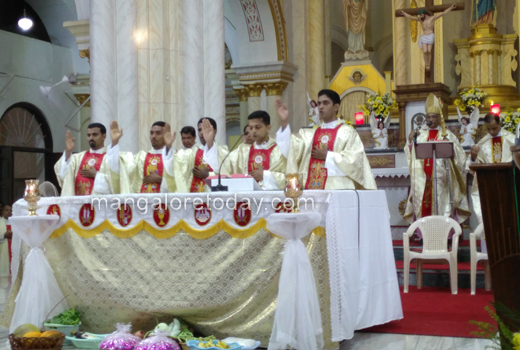 Mangaluru, Apr 17, 2018 : The diocese of Mangalore which has a phenomenal number of priests and several priests are serving in other parts of India and overseas, got a gift of 5 new priests. 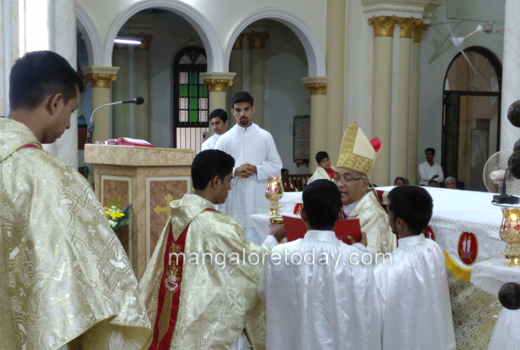 The ordination - anointing/ ’Abishek’ or ’Deeksha’ a solemn ceremony of the church was held on April 17, Tuesday, at Rosario Cathedral, presided over by Rev.Dr.Aloysius Paul D’Souza, Bishop of Mangalore, assisted by a large number of around 100 clergy who celebrated the ritual along side the bishop. 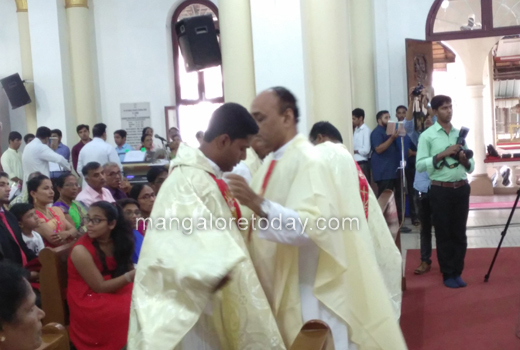 In particular they in turn laind their hands on the 5 new priest and prayed that they be filled with the spiritual blessings and powers to serve the church of Mangalore and and it’s people fruitfully. 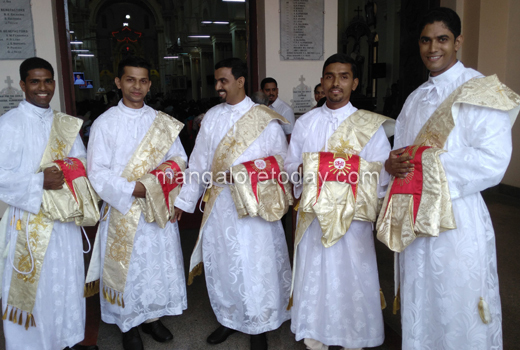 The five New priests are : Rohan Dias of Taccode, Rupesh Tauro of Allipade, Ashwin Crasta of Kumbla, Flavian Lobo of Thodambila, Thrishan D’Souza of Permannur. All have been preparing for this day for about 8 years at st.Joseph’s Seminary, Jeppu. Now their commitment and service to the church will commence after they go to thier respective parishes, and give thanks with a very spacial first mass. along with their kith and kin. They have charted out a sutable path to take in thier immediate religious mission. Indeed it is was a festive atmosphere all through the near 3 ritual which was very orderly and spiritual. 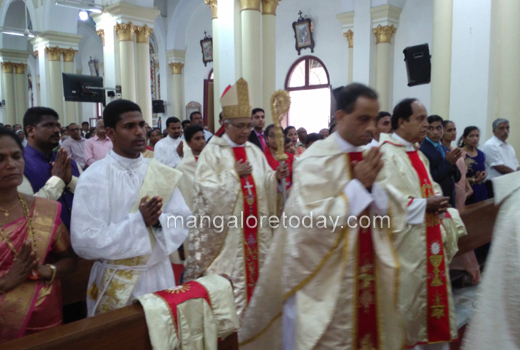 A large number of clergy, religious, family members of the new priests, well wishers and congregation filled the Cathedral, the singing was very well organised. 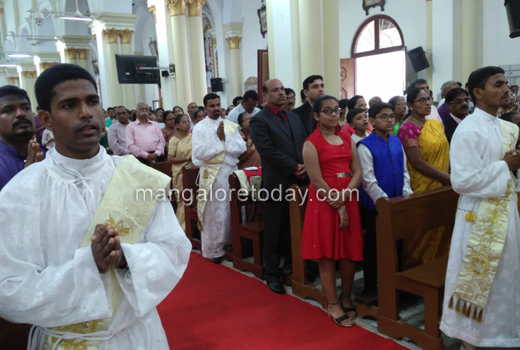 immediately after the religious rituals, a felicitation programme was conducted and the new priests with their parents and siblings were sutably honoured by the Bishop and guests. Ordination is the sacramental ceremony in which a man becomes a deacon, priest, or bishop and enabled to minister in Christ’s name and that of the Church. There are three ordinations in the Sacrament of Holy Orders: diaconate; priesthood; and episcopal. The ordination ceremony includes various rituals, rich in meaning and history, e.g., prostration, laying on of hands, anointing of hands, giving of the chalice and paten, sign of peace. The essential rite of the sacrament, i.e., when it takes place, is the laying on of hands and prayer of consecration. This is an ancient tradition in the Church, mentioned in the Bible. Only a bishop can ordain a priest because he shares in the ministry of Jesus passed down through the apostles. By this ritual the ordaining bishop and the other priests invoke the Holy Spirit to come down upon the one to be ordained, giving him a sacred character and setting him apart for the designated ministry. Prostrating symbolizes his unworthiness for the office to be assumed and his dependence upon God and the prayers of the Christian community. Vestments that the new priests put on, pertain to his office and have symbolic meaning. The stole symbolizes the authority and responsibility to serve in imitation of Christ. It reflects the line from Scripture: “For my yoke is easy and my burden light.” (Matthew 11:30) The chasuble is the principle garment of the priest celebrating the Eucharist and is the outermost vestment. A man has to engage in a challenging program of priestly formation which lasts from five to thirteen years, depending upon his background and the seminary he attends. There are three levels of seminary: high school; college/pre-theology; and theology. In 1999-2000, over 700 students attended high school seminaries, 1,576 attended college seminaries and 3,474 were enrolled in theology schools. Seminaries address four types of formation: human, spiritual, academic (intellectual) and pastoral. In addition to the academic course work, seminarians participate in a full schedule of spiritual activities, e.g., daily mass, Liturgy of the Hours (Morning Prayer, Evening Prayer), and spiritual direction and retreats. At each level of seminary training, the seminarian prepares for future pastoral ministry in various settings, such as schools, religious education programs, hospitals, prisons and parishes. All of the formation takes into consideration the human person; human growth and development is fostered by community living, workshops and other programs. The formation of future priests includes practical learning, too, for example, preaching, presiding at Mass and pastoral counseling. Priests who belong to a religious order (e.g., Dominicans, Benedictine, Franciscans, etc.) take the vows of poverty, chastity and obedience. 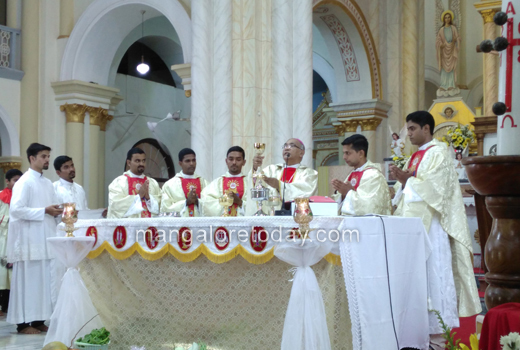 Diocesan priests make two promises- celibacy and obedience; these promises are part of the ordination ceremony. It is also expected that diocesan priests will lead a life of simplicity consonant with the people they serve.